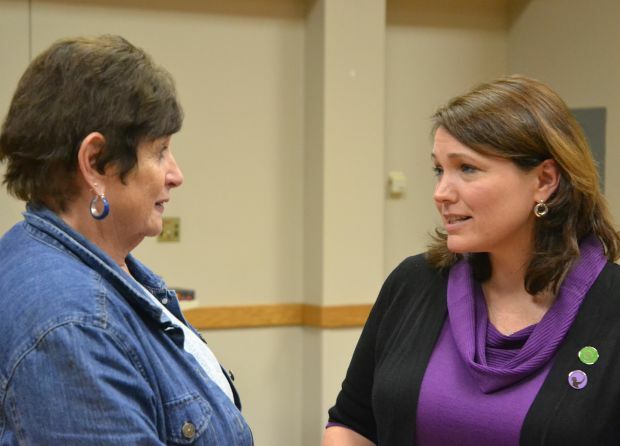 The mother whose 6-year-old son, Dylan, was killed in the shootings at Sandy Hook Elementary School Dec. 14, 2012, along with 19 other children and six adults, spoke to a crowd of several hundred at Loras College. She also spoke at Clarke University during her visit to Dubuque earlier this fall. “Sometimes when you lose someone you love and all hope seems lost, that is when you find strength you never knew you had,” Hockley said at Loras, a Catholic college. “The strength doesn’t come from grief or despair or anger. It comes from faith. Hockley now directs communications and outreach for Sandy Hook Promise. The charity, started by families who lost loved ones at Sandy Hook, aims to prevent gun violence by starting a grass-roots movement in communities around the nation. Hockley was later joined on stage by Tim Makris, executive director of Sandy Hook Promise, to take questions from the audience. Both explained that the goal of the group was not to ban all guns or attack responsible gun owners, but rather to work together to find solutions, including promoting education on the causes of gun violence, gun safety and mental wellness. Hockley and Makris drew a distinction between “mental illness” and “mental wellness.” Whereas only about 4 percent of incidents of gun violence in the United States is carried out by people with serious mental illness, the majority is done by people who lack mental wellness because of anger issues or other problems, according to the speakers. Hockley said solutions begin with education about what causes gun violence. Her group encourages “Promise Communities” at the local level, which receive tools from the charity. All those who join Sandy Hook Promise are asked to pledge to work to end gun violence. The organization’s website is www2.sandyhookpromise.org. Sandy Hook Promise focuses on education to foster social change, provides resources to promote mental wellness, and gun safety in homes. Hockley also mentioned support of gun laws to increase safety, which everyone can agree on — such as background checks. A portion of Hockley’s remarks focused on the personal toll the tragedy took on her. Hockley credited the love of friends and family and their patience with helping her work through the grief. For many, the healing process is still going on two years later, according to Makris, whose son was in the school that day. Hockley and Makris called Sandy Hook Promise’s mission to change the culture of violence a “marathon” instead of a “sprint,” one that will require average people to step up. Russo is a staff writer at The Witness, newspaper of the Dubuque Archdiocese.